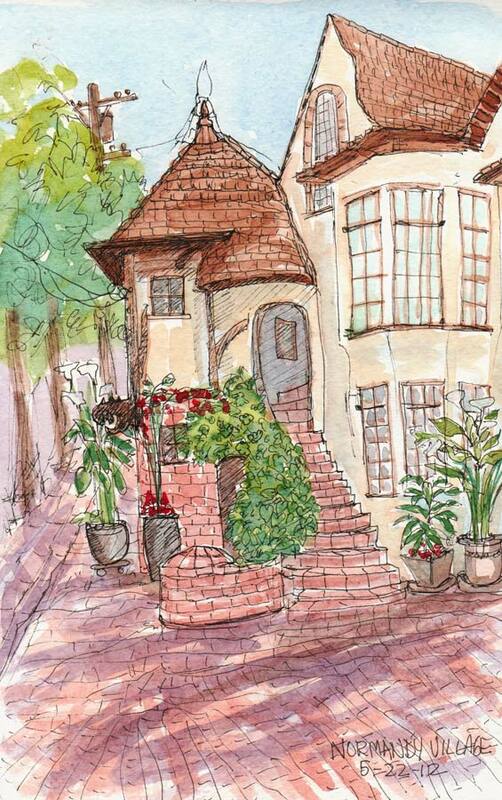 This sketch of Normandy Village in North Berkeley got lost, passed by in my journal and never got posted. When I uploaded the image I was surprised to see a May date on my screen and went to grab my sketchbook to make sure that was right. Sometimes if I’m in the sketching “zone” I lose track of things like dates, and write the wrong month or year. I couldn’t find my sketchbook. I knew I’d had it with me on at least one of my errands today because I sketched in it. I looked all over the house; no sketchbook. Then I went to grab my car keys to see if I left it in the car. I couldn’t find my keys. I’m usually very organized and always put my keys in the same place but they weren’t there. Finally I opened the front door to see if I’d dropped them (which doesn’t make sense because I obviously needed them to get in the house!) and there were my keys, hanging on the outside of the door in the lock. Duh! I’d left them there when rushing in the door to take care of an urgent need, shall we say. I grabbed the keys, beeped the car door open but the sketchbook wasn’t there either. Panicking, I made a second search of the house and found my sketchbook on my bed, hidden in plain sight. I was going to sketch it sitting on the bed and post that picture right here, but realized I couldn’t sketch it while sketching in it. And the sketch was from May. You can read about Normandy Village on my previous blog post here. love your Normandy sketch Jana. Has such a delightful mood and the elements are inviting and intriguing. I hear ya about losing things, i’m the queen of that! OH too funny Jana, I go through times of loosing things too. Some weeks are better than others! Glad you found this sketch. It has a nice garden-y feel to it. –looks like a nice place to live. Such a familiar scenario. An acquaintance of mine, in her 70s, was recently worked up for senile dementia. Whenever I talk to her and have word finding problems, or relate some incident like this, she’ll chirp, “Symptom!” While I don’t quite believe it, being 20 years younger and seeing many friends with the same issues, I can never quite not believe it either!!! When you lose something, say a prayer to St. Anthony, he never fails to find me what I lost. Just pray and keep looking. I usually forget about it for a couple of days and suddenly it pops up like magic! St. Anthony always comes through. I stipulation: You need to make a donation to the poor in thanksgiving for finding you lost item. Hope it helps. God bless us all. I forgot to mention that I love your sketch!